WHY GO: Penn State in State College PA is on the college tour, of course! But there’s so much more here than the Campus, its Museums, and Arboretum. Drive a few miles and you’ll find yourself at the center of the Stamp Collecting world, inside the Country’s Only “All-Water Cave and Wildlife Park”, and, incredibly enough, within inches of the traveling desk that Christopher Columbus might have had with him as he “sailed the ocean blue in 1492.” There are surprises galore on this mid-Pennsylvania Getaway. Follow along here…. TOUR: Boal Mansion, Vault, and Columbus Chapel, Boalsburg. It almost seems too suspect to be true: the cross that Christopher Columbus used to claim unexplored land and his circa 1400’s Admiral’s Desk in a vault in this tiny mid-PA town? And, slivers of the True Cross of Jesus, too? Well, at least one of those has been authenticated, the other taken on faith, but both artifacts have ended up in this small town location, the home of 8 generations of the Boal family, in Boalsburg PA.
How? The fifth generation Boal, Theodore/Teddy, an architect, met Spanish born Mathilde Dolores Denis Lagarde while attending the prestigious Ecole de Beaux-Arts in Paris. Mathilde was the niece of Victoria Columbus Montalvo, widow of Diego Colon, a descendant of Christopher Columbus, and because Victoria died childless, the Colon (Columbus in English) family artifacts passed down from her to Mathilde in 1908. These Family treasures included not just the travel desk, but some shackles from CC’s ship, the Santa Maria (that were not used to chain slaves: the famous explorer was notoriously distrustful of his own men), and the complete Columbus Family Chapel – dating back to the 1400’s – from the Columbus Castle in Asturias, Spain. Consequently, little Boalsburg PA is home to the most significant collection of Christopher Columbus artifacts in North America. Teddy, a Protestant, had the Catholic Chapel installed on Boal Mansion’s grounds, using good old Pennsylvania limestone for the exterior, and incorporating original pieces like the carved door and alter (15th century oak), and marble cross. Portraits of the Columbus family depict them as saints, as was done back then for wealthy dynasties. The original Colon Family Crest is built into a railing in the rear of the sanctuary. Original vestments with silk and gold thread are kept in airtight drawers. One, adorned with Skull and Crossbones, was used for funerals. At this point in the tour, your guide will open the cabinet door where a “relic query” holds two splinters of what is believed to Christ’s Cross. It was said that Mathilde took solace in the consecrated Catholic Chapel when her husband and son were off fighting in France during the Great War (WWI). At first, Columbus’s Admiral’s Desk sat among the gilded alter and artifacts inside the Chapel. Over time, humidity and fluctuating temperatures started to take their toll, and so the desk and a stack of Columbus Family papers believed to be hundreds of years old, discovered in a cabinet crumbling with decay, have been moved into a third building on the property – a temperature-controlled walk-in vault. The papers have yet to be digitized. Though credited with “discovering America,” Christopher Columbus never sailed farther north than what is now the Dominican Republic and never set foot on mainland USA. He went back to Spain, negotiated a 10% deal with Queen Isabella on all the riches gleaned from the New World, and made his family quite rich. A tour of the Boal Mansion Museum, Vault, and Columbus Chapel includes all three structures. Photos and portraits of Presidents, celebrities, friends, and family members cover every inch of every wall throughout the 2-story home. Both Teddy and his son, Pierre, served admirably during WWI: Teddy trained troops here to fight the Keiser, and then fought for the US with the 28th Infantry Division, Pierre with the French Cavalry. Pierre, like his father, also married a French woman, Jeanne de Menthon, and was appointed Ambassador to Peru and Nicaragua under FDR. One of Pierre’s daughters, Mimi, married the Governor of Maryland, Blair Lee, a Richard Henry Lee descendent. The wedding generated congratulations from Presidents and dignitaries. Do you see where this is going? The Mansion holds a hoarder’s heaven worth of stuff – much of it incredibly valuable or at least historic. It was said that “Teddy inherited three fortunes and spent them all.” He collected everything. There’s a deck of cards and lock of hair from Napoleon Bonaparte, the White House piano that belonged to Dolly Madison, put on the market when Teddy Roosevelt moved in, a piece of a plane that Col. Boal shot down in France, and upstairs, a whole armory exhibit that includes Col. Boal’s Colt 45 with its original holster and purchase order from the US Government. There’s also a great deal for the fashion obsessed: Louis Vuitton trunks full of early 1900’s Parisian fashions provided the array of dresses on display in another upstairs room. One dress, worn by Renoir’s lover in his portrait of her, is on display behind the painting. Upon his return from his Ambassadorship in 1952, Pierre Boal donated the house as a museum as is – “Clutter and all.” The next year, the Boal Barn Playhouse, the oldest continuously operating summer stock Theater in a Bank Barn, was established on site, and is still going strong. Pierre Boal and his father, Theodore, are buried in the Chapel crypt, though, after her husband’s death in 1938, Mathilde went back to France and passed away there in 1951. More and more people are discovering this eccentric place with its dizzying number of important artifacts that once belonged to world-renowned historical figures. It definitely should be on your visit to the Penn State area. 1 ½ hour tours $10 adults, $7 kids, open May through October, Tues-Sun 1:30-5, last tour at 3:30pm. GO: Pennsylvania Military Museum and Shrine to the 28th Infantry Division, Boalsburg. Across the street from Boal Mansion, it’s easy to combine a visit here with a tour of the Boal Home and Chapel. Though small, this military museum is engaging and well designed, with a focus on the lesser-known WWI up to current military operations. Begin by walking through a trench, and into rooms replete with jeeps and tanks. The park itself and its War Memorials are beautiful, and a walk around is a good way to pay your respects to our lost soldiers, and take in some fresh air. Open Wed-Sat 10-5, Sun 12-5, $6 adults, $4 kids. VISIT: American Philatelic Society Headquarters at the Match Factory, Bellefonte. A quick 20 minute drive from State College brings you to Bellefonte, a lovely “river runs through it” kind of town and center of the universe for all things philatelic. “Philatelic” may be a mouthful of a word, but in essence it concerns stamp collecting and postal history – with an emphasis on academic research. Who knew that the hobby some of us pursued as kids could be so exciting? The APS, founded in 1886, “is the largest, most influential and respected organization in the world of stamp collecting.” Aside from publishing the American Philatelist Quarterly and Philatelic Literature Review, sent to 28,000 members worldwide, the APS bestows annual awards on those who conduct distinguished research and are major donors. The Headquarters is comprised of several departments, including the magazine publishing office, operations, and, several reasons to visit: a small museum, the largest public access Philatelic Library in North America, and the rescued Old Headsville WV Post Office, still operating as a Bellefonte PA P.O. The museum’s key exhibit, “Alphabetilately A to Z,” created for the 15th anniversary of the Smithsonian’s National Postal Museum in Washington DC, and on permanent loan here, is worth a long look. Twenty six panels pasted with stamps that correspond to the alphabet – Cinderella Stamps, Duck Stamps, EFO’s (Error’s, Freaks, and Oddities – yes, a stamp classification), Local Post, Overprint, Persian Rug (refers to security patterns in the background), War Issues, Zeplin Post, and the like invite closer inspection. Collectors are forever watching out for errors, and one of the fan favorites is the “Inverted Jenny” – an airmail stamp with an upside-down airplane. One sheet of 100 stamps made it into the market, making them very rare indeed. (A member donated a single Inverted Jenny to the APS, which is held in a safe. A facsimile is on display). Did you know that you could send live chicks through the mail? Raw eggs? You’ll discover this at the relocated Old Headsville Post Office, from which you can buy new stamps and send mail (canceled stamps read: “American Philatelic Society, Bellefonte PA”). The day after the new Mr. Rogers stamp was released, it was sold out here. In a scene that tapped into the compassion of Fred Rogers, as the sheets of stamps were selling out, people who were fortunate enough to be early in line started buying just one stamp each so that others behind them could get one as well. Museum open Mon-Fri 8-4:30, free. TASTE: Big Spring Spirits, Match Factory, Bellefonte. Just around the corner from the Philatelic Society in the same complex, Big Spring Spirits has one of the prettiest distillery tasting rooms I’ve ever seen. By dint of its aesthetics, quality of its products, and innovative mixed drinks, Big Springs Spirits is not only the perfect follow-up to a visit to the Stamp Society, but is worth a drive from anywhere. Décor has a woman’s touch – there are table lamps, floral print chairs, and of course a lovely bar at which you can order Big Spring Vodka, Straight Corn Whiskey, or any of the fantastic craft cocktails made with those spirits and others distilled in the back room. Examples: Hawaiian Lion – gin, basil, pineapple syrup, club soda; Harvest Mule – aged corn whiskey, ginger beer, local apple cider; and my favorite – Salted Caramel Martini – vodka, dulce le leche, salt and cream. Heavenly. Pair these up with food offerings, like humongous pretzels, Charcuterie (4 items, $19), Roasted Baby Kale and Beet Salad ($12), or White Wine Braised Pork Mac and Cheese, and you’ve got yourself a meal. The latest, and most popular trend here: cartons of 8 different Grab and Go Cocktails that are a big hit with Penn State tailgaters. TOUR: Penn’s Cave and Wildlife Park, Spring Mills. You can’t miss ads and billboards for this attraction about a 25 minute drive from Penn State. Touted as the “Only all-water Cavern AND Wildlife Park” in America: See It By Boat!” this show cave has been delighting tourists for 133 years. Though there’s a Wildlife Park Safari on the premises (combo tickets available), those short on time should opt for the mainstay: a half mile boat ride though the otherworldly cavern of dripping stalactites and unusual formations, mostly in darkness, and then out into the river/spring that feeds the cave. Yes, it’s touristy – but you’ll never see anything like it elsewhere. FYI – you’ve got to be in relatively good shape to walk down a long hill and steep sets of stairs to get to the small boats that hold about 20 people and leave every 10-15 minutes. $19 adults, $11 kids, March-Nov daily, Dec and Feb weekends only – check website for hours. VISIT: All Sports Museum at Beaver Stadium, Penn State. I didn’t go to Penn State, and I don’t have much interest in sports. 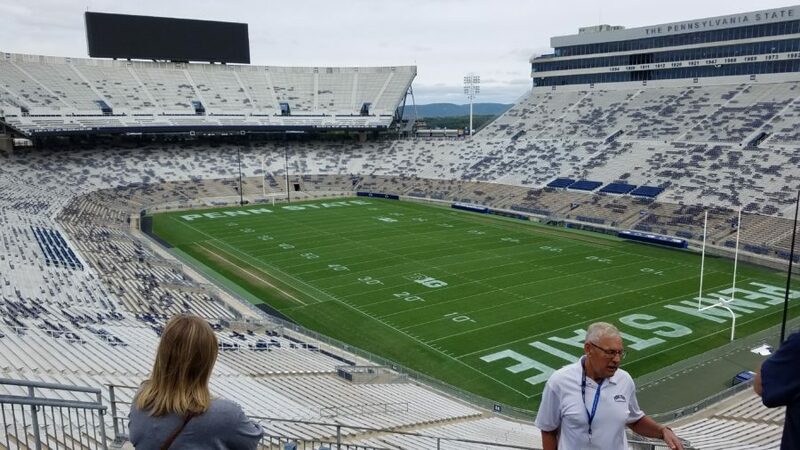 But, I gamely went to Beaver Stadium, home of the Nittany Lions, and the second largest college stadium in the country (at 106,500 seats, second only to U of Michigan, with 109,000 seats), to check out the All Sports Museum. I’m glad I did. The stadium itself is imposing, but the museum swept me up in the fierce devotion, positive striving, and competitive spirit of the “Blue and White.” A sport by sport walkthrough on two floors, with interactive opportunities in some – lift a 100lb dummy in Wrestling, “be a sharpshooter” in the Rifle section (where I also learned that the sport had its origins in WWI Student Army Training in 1917), give a boxing bag your best shot – it’s a multi-media extravaganza of shouting crowds and clashing athletes playing on myriad screens throughout. Not one sport is left out: Gymnastics, Fencing, Basketball, Volleyball, Swimming and Diving, Bowling, Ice Hockey, Field Hockey, Track and Field, Cross Country, Soccer, Lacrosse, Softball, Baseball, Golf, and of course Football. The Sandusky scandal is glossed over, and Joe Paterno is lionized posthumously, which is to be expected in this rah-rah museum that accentuates the positive. If there’s no game going on, ask to be escorted up the elevator to the 4th level Club Room. You’ll get a great overview of the surrounding “Happy Valley” landscape and of an eerily empty stadium. Open Tues-Sat 10-4, Sunday noon-4, $5 adults, $3 kids. VISIT: Palmer Museum of Art at Penn State. Another great college Art Museum, The Palmer (largest art museum between Philly and Pittsburgh) focuses on American Art from the 18th Century through today, with detours into 16th and 17th century French and Italian religious art, stoneware from around the world, and important glass pieces. What is most compelling here, however, are the clever juxtapositions – a 1972 Botero rendering of a portly nun right beside Jeff Davies 1980 portrait of the beer-bellied Jerome Paul Witkin – and innovative sculptural materials – the Willie Cole multi-petal flower sculpture made entirely of shoes. The most disturbing piece, at least to me, is upstairs in the William Hull Gallery: a bronze sculpture, created in 1933 by Jewish dentist-turned-artist, Seymour Lipton, called “Lynched.” A dead black man in fetal position, mouth open, rope around his neck and hands bound behind him; it’s a powerful statement on the sanctioned murder of Black men in the South – a representation that Lipton fashioned while it was still going on to a lessening degree. I couldn’t tear myself away. Open Tues-Sat 10-4:30, Sun noon – 4, also 6-9pm on “Third Thursdays,” free. WALK: Arboretum at Penn State: H.O. Smith Botanic Gardens. A copse of evergreen trees pierces the sky, and colorful sculptures and flowers beguile throughout this serene arboretum. No wonder it’s one of the most popular attractions on campus. There’s a Children’s Garden, a Lotus Pool, Tropical Grove, and Marsh Meadows, and many more gardens to explore. Plan on at least 30-40 minutes to meander and appreciate the art of both Mother Nature and Man. Open daily dawn to dusk, free. ICE CREAM: Berkey Creamery. Those on a quest to find the best ice cream in America will most likely join the long line to the counter in this blue and white cafeteria-like ice cream parlor. Penn State is known for its ambrosial and creamy versions – dispensed on campus in the Food Science building. Little known fact: Ben & Jerry split the $5 cost of a Penn State ice-cream-making correspondence course, and then famously opened their first shop in Burlington Vermont. Open 7am-10pm. EAT: The Gardens at Penn Stater Hotel. (See in hotel review below). STAY: Penn Stater Hotel, State College. This corporate looking hotel welcomes you with a mid-century modern living room – complete with roaring gas fireplace – as soon as you walk through the door. It’s a charming first impression of the place where many Penn State parents, prospective students, and visitors to the area stay when they want to feel at home in the land of the Blue and White. Walk around, and you’ll see Nittany Lions everywhere. A sprawling conference center, wedding and event venue, The Penn Stater is always pretty busy, so you might have to wait on line to check in. Just know that reception folks are friendly and kind, and want to give every guest all the information they need for the best stay. At first glance, guest rooms seem like those in your standard mid-high end hotel, but look closer and you’ll see details that give them extra appeal. Very comfy beds are clad in white duvets and sport blue throws, and navy leather upholstered chairs (with ottoman) offer the perfect place to read and write. Large bathrooms, in wood and terra cotta hues feature a textural floral tile backsplash behind the granite bathroom vanity. Toiletries are from Gilchrist & Soames, but the pretty labels are photos of the Arboretum, taken by Penn State Students. Two restaurants on site: the rah-rah (or should I say, “roar!”) sports-bar, Legends, and finer “The Gardens.” I’m always wary of the food at large conference hotels, especially those that offer generally uninspiring dinner buffets. With a large captive audience, it’s usually anything but destination dining. But I was so wrong about The Gardens. The food was terrific. I had been told that most restaurants in town cater to Penn State students, so locals reserve a table at The Gardens when celebrating a special occasion. On the night I dined there, the feature buffet was “America’s Bounty,” and the tastes, variety, freshness, and innovative menu items were astoundingly good – and all for the unbelievable cost of $24.95 per person! I started with Mushroom-Brie Soup, which was so delicious I wanted seconds right away. But, there was so much more to try: Grilled Marinated Sirloin Steak with Sauce Robert – expertly cooked, right off the grill – followed by Brick-Roasted Chipotle Ranch Chicken with Andouille Cornbread Stuffing, Honey Glaze, and Tequila-Lime Crema. There was Swordfish with Fattoush Salad and Pomegranate Molasses; Mussels in Curry Sauce; Peel and Eat Shrimp; a groaning Cheese Board, and so much more. But you get the gist. This was not a Denny’s meal. So far from it, I would have gone back again if I’d stayed another night. Though a couple of miles from the Penn State Campus and downtown State College, a complimentary shuttle is available for guests daily from 5am-11:30pm. Complimentary coffee each morning 5am-10am. 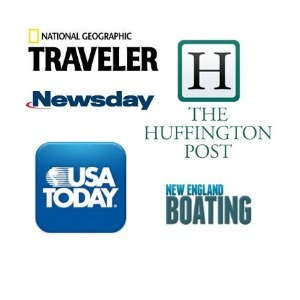 Rates from $119 per night include coffee, wifi, parking, local shuttle. STAY: As a college town, there are plenty of chain hotels to choose from. If you’re averse to big hotel brands, The Nittany Lion Inn and Atherton Hotel in town are good independent alternatives.